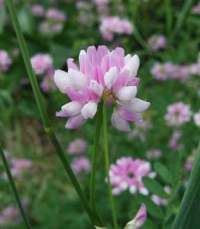 Crown vetch is a member of the Pea or Fabacease family. It is a low growing vine commonly used through the United States for erosion control, roadside planting and soil rehabilitation. 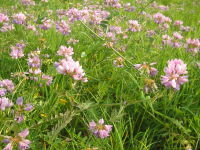 Crown vetch is toxic to horses because of the presence of nitroglycosides. Consumed in large amounts it can result in slow growth, paralysis or death. HABIT: Creeping stem reaching 2 – 6” length and 12 -48” height. Lavender-pink flowers in 1” clusters, followed by brown seedpods. LEAVES: The compound leaves range from 2 - 4" in length and have nine to twenty-five leaflets. Leaflets are one to two cm long, oblong with persistent stipules 15 – 25 leaflets per leaf. CULTURE: Hand pulling of mature plants can be effective when controlling small initial infestations. Mowing plants in the flower bed stage for two to three consecutive years may reduce the vigor and control. and further spread. Plants should be cut before seeds mature and as low to the ground as possible. It can be control by spot-spraying vinegar. USES: Ground cover for cut banks, erosion control on slopes. BLEMS: Toxic to horses, invasive. NOTES: Very invasive plant that probably should not be used. Seed can remain viable for 15 years. It is now a serious invader of prairies and dunes. 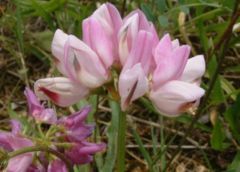 It is found in disturbed remnant prairies and woodland edges, gravel bars along streams, as well as agricultural land and roadsides. It prefers open and sunny areas. It was introduced from Europe and southeast Asia during the 1950s as groundcover, bank and slope stabilizer along roads and waterways, and as green fertilizer crop, and it is still sold commercially.